Royal Durban Golf Club is one of the very few golf courses to be sited in the middle of a horse racing track and has hosted some renowned golfing tournaments in the last 100 years. 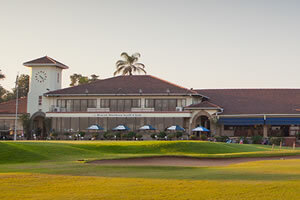 Situated in the heart of one of South Africa’s largest “melting pot” cities, Durban, lies the Royal Durban Golf Course. Confined within the grounds of Greyville Racecourse since inception, the club dates back to 1892 and has changed dramatically over the years. Bob Grimsdell was commissioned to rebuild the course in 1932 and it quickly became known for its unforgiving rough. Being flat and tree-less the course seems, at first, to be an easy game. The prevailing winds and aforementioned rough as well as being in such close proximity to the racecourse have added an incredible challenge not fully appreciated until you’re in the thick of it. Notable tournaments played here include the South African Championships and the Commonwealth Tournament of 1975 in which the eighteen year old Nick Faldo played at. Holes are balanced well in length and the par 4 9th is the courses signature. Visitors are of course openly welcomed and the chance to play a round on one of South Africa’s oldest and most unique courses should not be missed.